When I make dessert, I tend to have a plan. I’d rather save the improvising and fridge cleaning for savory preparations. This cobbler, however, might go a long way toward loosening me up in the sweets department. First published in The Washington Post as Meme’s Blackberry Cobbler a decade ago, it was a gem just waiting to be rediscovered. The recipe comes from chef, cookbook author and Southern food expert Virginia Willis, who included it in her book Bon Appetit, Y’all the same year. 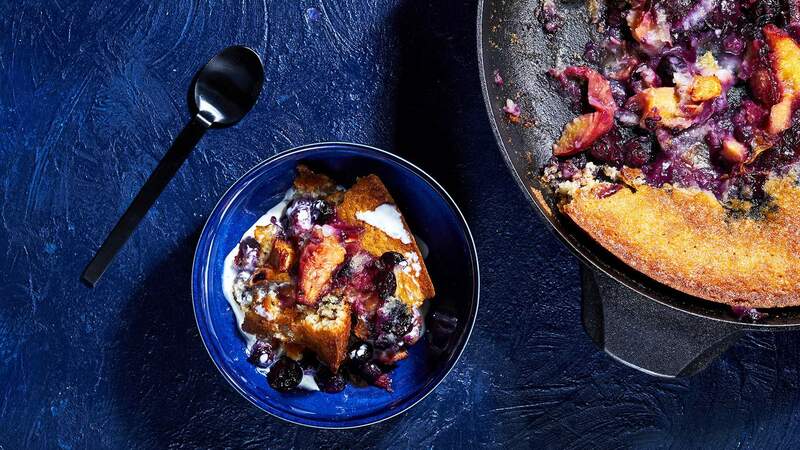 Willis fondly recalls going on long road trips with her grandparents, during which she and her grandfather would forage for berries that they would bring back to her grandmother – the Meme of the original recipe name – to bake into a cobbler in their camper. But you don’t have to forage for wild blackberries to make this cobbler (if you can, lucky you). The farmers market or your refrigerator will do quite nicely. At this time of year, Willis says the recipe is particularly well-suited to stone fruit and berries, although she is not a fan of cooked strawberries. In the three or four times I have made this, I came to the conclusion that the more the merrier, so my favorite combination involved peaches, apricots, cherries and blueberries. At other times of year, you can use defrosted frozen fruit. As long as your total amount of fruit is about 4 cups, you should be set. “It’s infinitely agreeable,” Willis says. She has tweaked her own recipe in a variety of ways beyond changing the fruit. The topping – essentially a cake batter – can be altered to swap in canola oil for some of the butter, or whole-wheat pastry flour or white whole-wheat flour for the all-purpose flour. Willis has also used rice flour and a gluten-free flour blend. Almond milk is a fine substitute for the whole milk, too. You can play around with the fruit filling, with additions such as citrus zest or juice, crystallized ginger and a tablespoon or two of alcohol. Moreover, you don’t even have to consider yourself a baker to make this. If you can cut and mash fruit, whisk together a batter and pour it into a pan, then you can make this. “It’s a dump-and-stir kind of take,” Willis says. The one thing you do want to make sure to do is first melt the butter in the oven. This not only liquefies the fat for the batter, but also heats up the baking vessel so the batter immediately starts to set and puff once it’s poured into the pan. With its efficiency at retaining heat, a cast-iron skillet is perfect for this, though Willis says you could also use a 9-by-13 Pyrex baking dish or a deep-dish pie plate (whose depth is key, so everything fits). If you’re camping out and cooking over an open fire, a lidded Dutch oven can work almost as well. However you make this cobbler, a scoop of vanilla ice cream or a cascade of heavy cream will always be welcome. “I think it really celebrates the fruit of the summer,” Willis says. What more excuse do you need? Celebrate away. First published in The Washington Post as Meme’s Blackberry Cobbler, this is the dessert present at every holiday table in chef Virginia Willis’s family. Meme was the family name for her grandmother, who made the cobbler with whatever fresh fruit was available when Willis and her sister would spend summer vacations on the road with their grandparents.This is a batter cobbler; when poured into a hot cast-iron skillet, the batter immediately crisps and swells.Serve warm with whipped cream, creme fraiche or ice cream. Make Ahead: Because this is served in the skillet in which it was made, it’s better to make the cobbler the same day it will be served. Ingredients:4 tablespoons (½ stick) unsalted butter4 cups fresh or defrosted fruit, such as blackberries, peaches, raspberries, blueberries, plums, cherries or apricots1 cup sugar, or more as needed1 cup flour2 teaspoons baking powderPinch fine sea salt1 cup whole milk1 teaspoon pure vanilla extractMethod:Preheat the oven to 350 degrees. Place the butter in a large (10- to 12-inch) cast-iron skillet (may substitute a large ovenproof baking dish) and place in the oven so the butter melts; this should take 5 to 7 minutes. Meanwhile, place the fruit in a mixing bowl. Use a potato masher to mash it just enough so that the pieces release some of their juices. If the fruit is tart, sprinkle a little sugar on top. Whisk together the flour, baking powder and salt in a medium bowl. Add the cup of sugar, milk and vanilla extract, stirring to form a smooth batter. Remove the skillet from the oven. Carefully pour the melted butter from the skillet into the batter, stirring to combine, then pour the batter all at once into the skillet (it should begin to puff and set around the edges). Add the fruit and its juices to the center of the batter. Bake for 35 to 40 minutes, until the top is golden brown and a toothpick inserted into the crumb comes out mostly clean. Serve warm, straight from the skillet. Nutrition (based on 8 servings): Calories: 260; Total Fat: 7 g; Saturated Fat: 5 g; Cholesterol: 20 mg; Sodium: 50 mg; Total Carbohydrates: 47 g; Dietary Fiber: 2 g; Sugars: 33 g; Protein: 3 g.
Source: Adapted from Willis’s Bon Appetit, Y’all (Ten Speed Press, 2008).